Engagement sessions are a lot of fun! It's probably one of the most laid-back, relaxing and exciting aspects of the entire wedding photography lifecycle. Engagement shoot provides a stress-free environment for both the couple and the photographers to get to know one another and work together. This dynamic comes in very handy on the big day. A typical wedding day can be quite stressful, and often the timeline can be rather packed. Having the experience of working with you, knowing your taste and preferences, and having you already familiar with our photography techniques provide efficiency. This ultimately helps us optimize the limited time we get for couple portraits on the wedding day. We view the entire wedding photography process, including engagement sessions, to be a very personal and intimate affair. We are here to tell your story; and it's always nice to bring out the love story in a location that have some sort of importance to you. The cafe that you frequent together, the bar where you met, the campus where you fell in love are all excellent locations that provide context and meaning to every photo. This is why often times couple will "know" right away the location where they want to take engagement photos, and we would gladly comply! Sometimes, however, there is no clear or easy location to pick from, and we can then discuss various options within New York City. There are many iconic and beautiful locations in and around NY that help us capture the essence of the Big Apple. Central Park, Dumbo in Brooklyn, Battery Park, Grand Central Station, Tribeca are some of our favorite locations that scream NYC! One point that you need to consider regarding popular New York City locations is that often these places are quite packed with tourists, especially in summer months and during late afternoons. This is too familiar a problem for us, and while we do compose carefully to minimize distracting elements, tourists and crowd are unavoidable features of popular NYC locations. If you want to avoid/minimize crowds, we'd recommend to choose morning session instead of afternoon. If you're willing to let go of some sleep, we can meet in early morning when the crowd will be much thinner compared to afternoon hours. 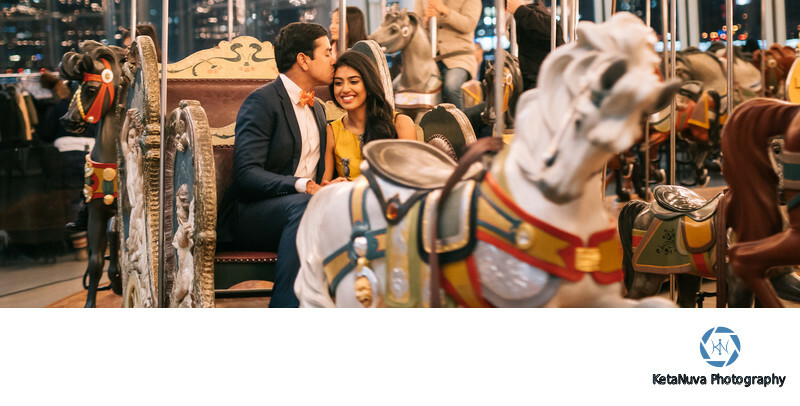 Here's a list of some of the popular New York engagement shoot locations where we've shot many times in the past. This is, of course, not comprehensive by any means but will hopefully give you some idea to think about your engagement locations. Dumbo and Brooklyn Bridge Park, Brooklyn. Central Park (Bethesda Terrace, Bow Bridge). Unlike weddings, we have much more flexibility choosing the timing for engagement sessions. We photographers love late afternoon and early morning light, often referred to as golden hour light, when the sun is at the low angle on the horizon casting beautiful golden light. This kind of light is ideal as it provides a soft glow on subject's face resulting in flattering portraits. We recommend against doing outdoor shoot in and around the midday sun. At this time of the day when the sun is high up in the sky, it casts harsh shadows especially under the eye. Time of the day matters relatively less if the shoot is going to be predominantly indoors, as the light indoors is much less dependent on the position of the sun. Weather is always a variable with outdoor photo shoots. As wedding photographers, we have to be and are comfortable shooting in various different types of weather and under various types of lighting conditions.Wedding day will go on no matter what the weather is! Engagement sessions, however, have more flexibility. We don't mind changing the date because of bad weather. However, we require a 48 hour heads-up. By that time, you can reasonably predict the weather. There's a small fee if we need to shift the date within 48 hours of the shoot. The most important piece of advice we can give here is to wear something that you are comfortable with. For example, if you are used to wearing flats, you probably wouldn't enjoy the session with towering hills. Here are some, hopefully, helpful tips in no particular order or structure. If you are planning to wear heels, plan to bring a pair of comfortable shoes/sandals so that you can wear those when walking from one location to another. Don't be afraid to wear bold colors! If there is prediction of rain or light drizzle, bring a pair of transparent umbrellas. They act as great props, one also providing essential protection during the rain! If you are bringing props we recommend taking some early photos with those and then putting those away. Similarly, if you are bringing a pet, we would be more than happy to take some cute photos with your pet. However, having a friend who can look after the pet would be helpful as you can then focus fully on the shoot.